In 2005 the unsuitability of our present premises became a burning problem for us. Due to the increasing attendance of our programs we grew out our rented apartment in a block of flats. In addition we have been suffering from the continuous anti-Semitic harassment of our neighbours. We want to solve this problem with governmental help. Therefore as an independent Religious Organisation we started negotiations with Mr. Kálmán Gulyás, Hungarian State Secretary of Religious Affairs. Having understood our need he expressed his willingness to help. On a separate note we approached the Hungarian Treasury for allocating a suitable premise for our community goals. As a registered congregation we became eligible for such an allotment. Mr. Gulyás supported our application to the Treasury Property Directorate for more suitable premises. Thus Sim Shalom is now to obtain a villa (without the basement) in the flat leafy suburbs of Budapest, not far from the city centre. The building suits the requirements of the community, but needs complete renovation. We have just started an international fundraising campaign to finance this. Another financial benefit of becoming a registered congregation in Hungary is that now Sim Shalom is eligible for a 1 percent share of the income tax of each taxpayer disposing so. We are already earning a sizeable amount of our yearly income from this source to be paid for the first time in 2006. The breakthrough in this area happened at Purim when a newly born Conservative youth organisation, Marom invited our Rabbi to a round-table discussion. Its aim was to bring together the rabbis and representatives of Chabad-Lubavitch, Orthodox, Modern-Orthodox, Neologue-Conservative and Progressive streams of Judaism to introduce themselves to the general public. The next historical step towards acceptance of religious plurality in Hungary was a conference entitled ˝Dialogue on Judaism˝ at the Hungarian Academy of Science in November. It was set up by 18 secular and religious Jewish organisations under the name Jewish Community Forum. The main supporter of the conference was the American Jewish JOINT Distribution Committee. Sim Shalom actively participated already in the preparatory stage and had a strong presence there. Rabbi Katalin Kelemen gave a lecture on Progressive Judaism and participated at another round-table discussion. We offered two well attended Sabbath services and raised a great interest with our booth, too. Our media presence has remarkably increased, too. Sim Shalom and our Rabbi featured in half a dozen newspaper articles and TV programs. Sim Shalom community has organised its traditional family summer camp this year again, now in a different venue, in the Lauder-Joint Camp of Szarvas. We were thrilled to have the opportunity to “make ourselves at home” for the first time in this Jewish Camp. We also take this opportunity to thank the American Jewish JOINT Distribution Committee for granting us this possibility. In the special summer edition of our Newsletter you can read a summary of the main events in English. Members of our young adult group ˝Simchaz˝ attended the annual Eurojews Purim Party in Prague and they took a Summer Study Trip through NE Hungary to see the remains of the vanished Jewish communities there. They had their own booth at the ˝Sziget˝, biggest European Music Festival and at the Day of Solidarity with Israel. Sim Shalom had to organise all the High Holiday programs at external locations due to the great number of attendants. We had a Seder evening in Danube Palace, Rosh Hashanah in the synagogue of the Lauder School of Budapest and Chanukah in Spinoza Café and Theatre, each place suitable to accommodate more than 100 people. Louise Vasvari , Professor of Comparative Literature at State University of New York at Stony Brook gave a lecture on Imre Kertész, the world famous Hungarian writer, who won the 2002 Nobel Prize in Literature. Professor Ida Fröhlich, Associate Dean of the Pázmány Péter University, Hungary gave a lecture on the Dead Sea Scrolls and the history of the communities of Qumran. Antónia Szász, anthropologist and sociologist gave a lecture on her monograph ˝Embers˝ about Jewish revival of Hungary in Sim Shalom community, published by the Hungarian Academy of Science. In addition to the on-going regular courses of Torah Study, Liturgy and Hebrew, Rabbi Katalin Kelemen gave a Midrash course with the title ˝Dig together with the Rabbis˝. Following its success she is invited to be one of the teachers of an inter-denominational Beth Midrash course at Balint Jewish Communal Centre, Budapest. In year 2005 we entered another few memorable days into the virtual Almanac of Sim Shalom: we had two weddings, one adult Bat Mitzvah and a Brith Bat ceremony. Sim Shalom was represented at the biannual GA of WUPJ in Moscow in summer 2005, at the Beutel Seminar of WUPJ in Jerusalem for lay leaders of progressive Jewish communities in January and the Berlin Rabbinical Conference in May. We are grateful to Mr. Alex Dembitz whose generous donation made possible for three of our young leaders to get all the benefits from a Birthright Tour in Israel. Among our numerous visitors we had the pleasure to have a memorable visit of our Honorary Associate Rabbi Fred Morgan and his Synagogue group of Melbourne, Australia, Rabbi Joel Abraham and his confirmation class of Plainfield, New Jersey, Rabbi Francois Garai and his family of Geneva, Switzerland and Cantor Melanie Gall from Alberta, Canada who wonderfully contributed to our Yom Kippur services. 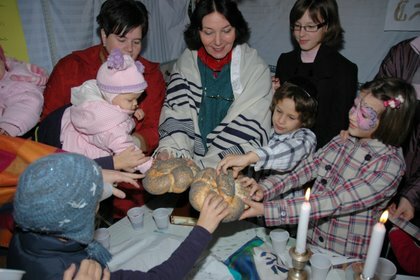 There were two interreligious meetings in 2005, a visit of the members of the Evangelical Student Alliance of Berlin and a lecture of Rabbi Dr. Ron Kronish, Director of the Interreligious Coordinating Council in Israel (ICCI), when representatives of the Christian-Jewish Council of Hungary were also invited. Our main task in the future is raising funds for the renovation of our new premises and afterwards the consecration of our new Synagogue. May we have power enough to fulfil this enormous job before the end of this year!